The Reports area for Groups has functionality identical to the Reports section in Membership. The two default reports allow you to print a roster for more than one Group or more than one Tag. You can also use these reports in conjunction with the Attendance Upload module, whereby you can upload attendance using a barcode scanner. 2. Select the filters, as desired. 4. The reports display all records with active Tag Status for a Tag Roster and active Group members for a Group Roster. The Attendance Upload module uses Roster report with barcodes for the class, date and individual. You can print a roster report for any Group or Tag. These steps assume you are using a Roster Barcode report for either a Group or Tag and the occurrences are automatically or manually generated. If not using the default Roster report, you can use any report that contains a barcode for the occurrence and each potential attendee. 1. Print rosters for each class/group/tag. 2. Mark attendance on the roster sheets. 4. 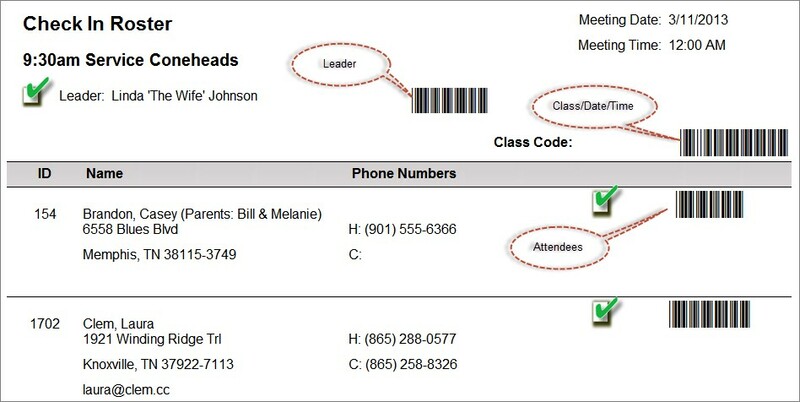 Use barcode scanner to scan barcodes for the leader, occurrence and attendees. Make sure the barcode scanner is set to scan into a text document. If the roster has multiple pages, you can continue to scan the Person ID codes on each page without scanning the Class Code at the top of each page. However, if a page gets out of order you can simply scan the Class Code at the top of the page and continue to scan Person ID codes, and the Attendance Upload module associates that attendance information with the correct occurrence. Most scanners work but Shelby Arena supports the Motorola CS3000. 5. Repeat steps 1 through 3 for each roster. You can use the same text file to upload attendance for multiple classes by scanning in multiple rosters. You must make sure that you scan the Class Code first for each new roster to record attendance for the proper class. 7. From the Check-In menu, select the Attendance Upload Page option. 8. Click the Browse button to locate the scanned attendance TXT file. 9. Click the Upload button. 10. Go to Attendance Summary tab of the respective group or tag to verify attendance upload.